Planning a Garden Border - How to Achieve the Wow Factor! Paying attention to the elements you use when planning a garden border can pay big dividends. Rather than just collecting a cadre of gorgeous plants, think about how your planting beds work as a whole to promote those extra special touches that get noticed in a landscape. There are just a few key principles to consider as you design. There is huge power in using expressive lines when planning a garden border. Curved or straight, line is an element that is just about always overlooked by homeowners planning their own flower beds. Adding these expressive lines into your small garden design will go far to set your garden apart. A little extra planning can do wonders for your planting beds. 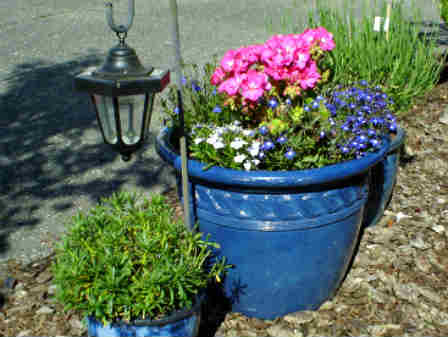 Plants, especially annuals, can be made to pop with a little pattern ingenuity. 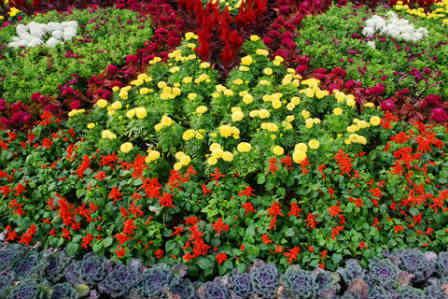 Many of you have seen plantings at the entrances of new home developments or in show gardens. This little bit of extra preparation can really add stature to your small garden design. 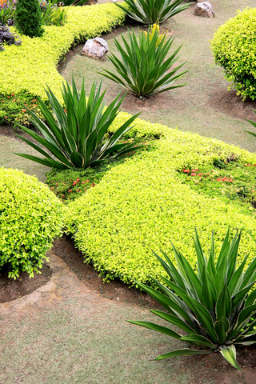 Arrange plants in geometrical patterns, in undulating lines, in repeating patterns. Play with color, give yourself permission to let it all hang out. Repeat patterns on opposite ends of the garden or give over a flower bed as an ever changing focal point. This sort of advance planning is what many businesses pay for when they retain a landscaping maintenance company. Why pay for what you can easily do at home?! I am a fan of using textural forms when planning a garden border. If you pay attention to this as you begin to purchase and place your plantings, as you choose materials, and as you add decor to your public areas, your garden WILL raise comment. This little secret is not obvious to the average homeowner, but every visitor notices when textural aspects are introduced into a garden space. Turn your planting beds into a piece of fine art by using bold textured plants next to fine textured plants, introducing spiky plantings into areas of mounding plants, juxtaposing small round leaves against larger, more tropical feeling plants. Adding visual texture is EASY if you just note the main visual characteristics of your chosen plants, and then add a counterpoint...it is that simple! Add a Pop of Bold Color! When planning a garden border for your home, it is tempting to go right to color as one of the first choices. We love color...it is one of the first things we notice in any space, and it is one of the longest remembered aspects of a garden. 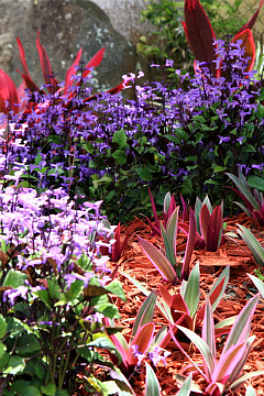 Care in using color however, can reap huge benefits in a garden design. 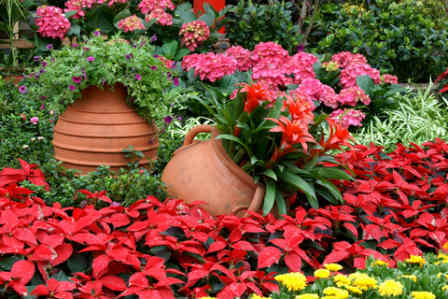 As you have thought through the various elements of planting design that we have reviewed on this page, you have likely imagined a couple of colors predominately, since that is a natural byproduct of our thinking. Now is the time to review those choices and think bold. Is there any element of the garden that would benefit from a bold choice? Using these pops of color in a space automatically directs early impressions of your garden...it becomes a major focal point. Contrasting color is an obvious choice for a focal point...but what if you don't want a particular area to become a focal point, but want to add an area of interest to a less exciting part of the garden? Color is one effective method of adding interest...just go a bit bolder with the same or similar colors in those parts of your garden beds, and you've added interest without stealing the show.